The President of the Maldives has declared a state of emergency in the Maldives starting from noon today. The Government assures the tourism and travel trade that all tourism related businesses will be operating as usual and the situation in the Maldives remains stable. 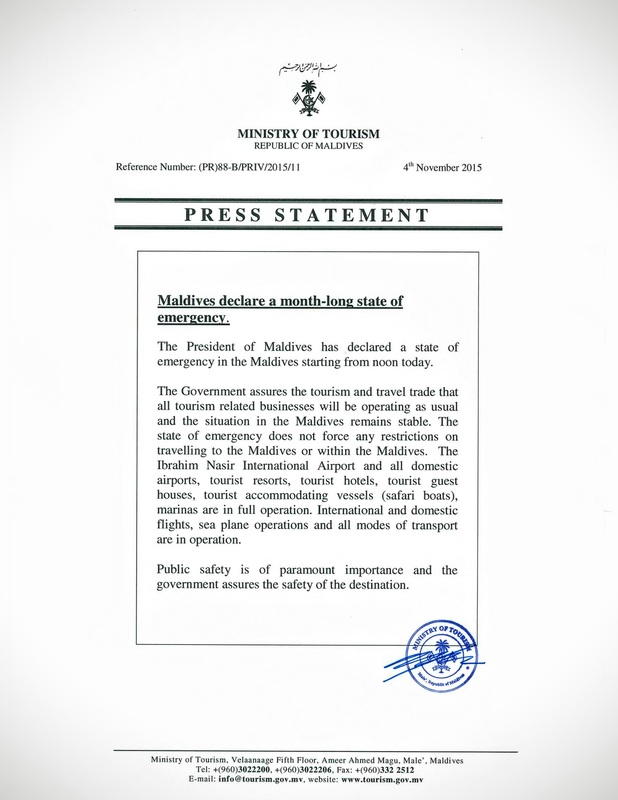 The state of emergency does not force any restrictions on travelling to the Maldives or within the Maldives. The Ibrahim Nasir International Airport and all domestic airports, tourist resorts, tourist hotels, tourist guest houses, tourist accommodating vessels (safari boats), marinas are in full operation. International and domestic flights, sea plane operations and all modes of transport are in operation. Public safety is of paramount importance and the government assures the safety of the destination.